Guess I have been tiptoeing around yacking about everything but that big monstrosity referred to as "the fridge." Fortunately I can keep it in the closet, but from there on my plans are sketchy. Here is the before picture to refresh your memory. And all I've really said is that the doors and the casing will be removed. My 38 year old refrigerator has been delegated to the back porch until new appliances are chosen. In case you are wondering the original finish on this was almond. I painted the front with chalkboard paint at least 10 years ago....maybe more. Obviously the stairs to the second floor pass overhead. The guys decided it would be OK to cut out the section where they have removed the plaster creating a little more room over the refrigerator. That done they proceeded to make the opening as large as possible. Because I had new hardwood flooring installed somewhere along the way, that flooring would not be under the areas now being removed. So all the flooring inside the closet was removed. It will be moved forward and relaid and some new strips will be added in the very back. This shows the other side stripped down to make it as wide as possible. Now what? This magazine clipping shows the general idea I have for this area although I probably won't have doors over the refrigerator. I only have 18" for the side cabinet and for what they cost, I have to make it useful. Here is a sample of the possibilities. 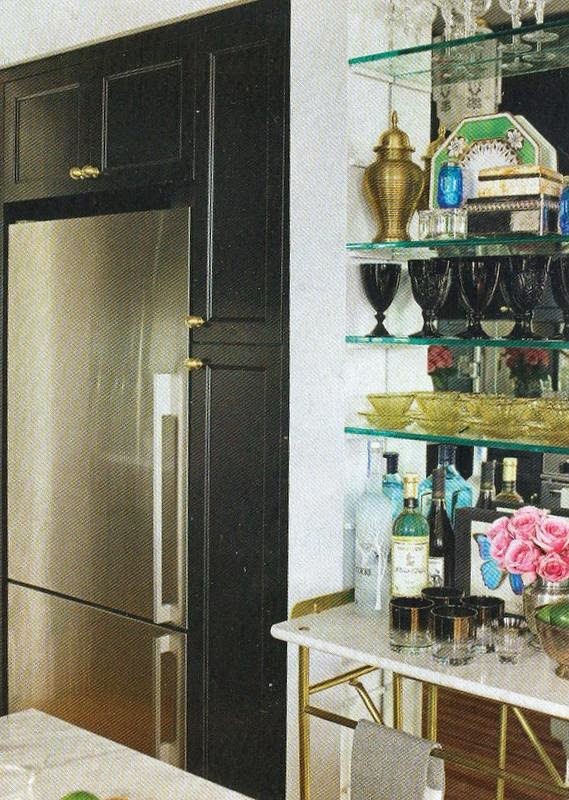 The small gray square on top of the marble looking piece is what I would like for my base cabinets. But I don't really want that for the pantry cabinet. 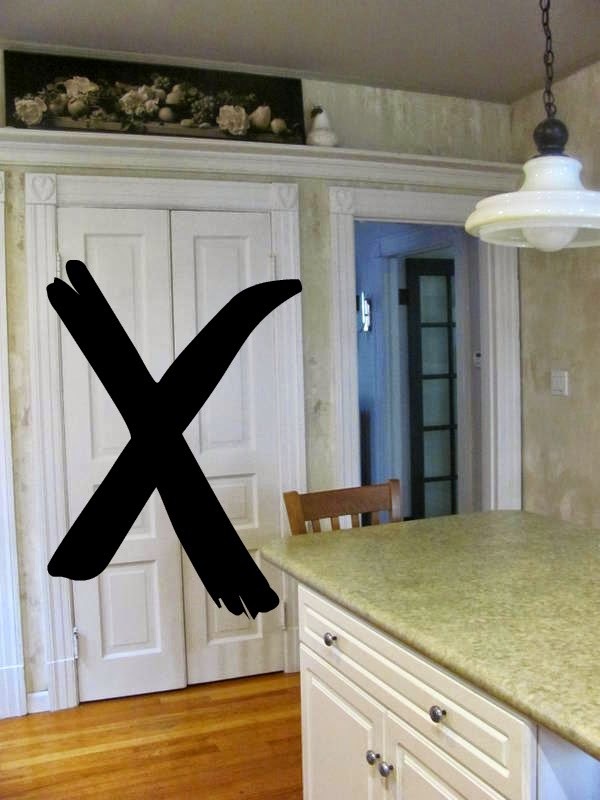 So I thought about using the the stained look on the cabinet samples in the background. (FYI: the boards in the background are two different samples of the same color) The square on the far left is a possible tile sample for the wall behind the stove. The one in the middle is a possible countertop sample for the island. The dilemma I am facing is that the stained wood samples look very different depending on the light. As you can see they look very brown in this photo and they have a more charcoal look in the previous photo. It's a tough call. Is there still an island?